Workers-Compensation-Law.us was created to help employees who are suffering from work-related injuries or illnesses get the benefits that they are entitled to by law. 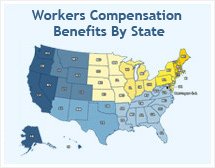 Since we know that many injured workers are denied Workers' Compensation benefits because they are less experienced with the complex state system than their employers, we have developed this website to help protect injured employees. We have carefully partnered with some of the most successful Workers' Compensation representatives and attorneys nationwide to provide FREE HELP with a no-cost Workers' Compensation claim evaluation and consultation. As a company, we have over 10 years experience providing online and offline resources to the public and helping them find the professional assistance they need to get what is rightfully theirs. If you've been injured on the job, we can help you. Whether you are filing a Workers' Compensation claim, have questions about your rights, or would like more information on your case; we are here with the expertise to get you the medical coverage and wage replacement benefits you deserve.